A 25-story Beaux Arts marvel situated in Chicago's iconic Loop District, Palmer House®, A Hilton Hotel is the longest continually operating hotel in the United States, boasting a vibrant heritage and renowned service. Originally built as a wedding present for Bertha Honore by her groom, Potter Palmer, the Palmer House is a historic city-center landmark with a legacy of romance. Guests are treated to the ultimate experience in luxury from the moment they arrive, with a two-story, gilded lobby with a formal staircase, marble-topped tables, velvet seating, and a ceiling mural depicting Greek mythology. The epitome of a grand hotel, the Palmer House boasts 1,641 guestrooms, including 177 executive rooms and 53 suites, over 130,000 sq ft of meeting and event space, and a variety of facilities and services to accommodate the unique needs of every guest. Situated within walking distance of the theater district, Art Institute, famed Magnificent Mile, and within one mile of Lake Michigan, the Palmer House is the ideal destination for a Chicago vacation, wedding, or meeting, offering the best of elegant accommodations, unrivaled hospitality, and a celebrated history. The Palmer House®, a Hilton Hotel is America's longest operating hotel celebrating 145 years of service and $215 million renovation and restoration. It was the first to incorporate the light bulb, vertical steam powered railroad (elevator), telephone, and creator of the brownie. Click here to learn more about Palmer House®, A Hilton Hotel and click here to learn about its history. 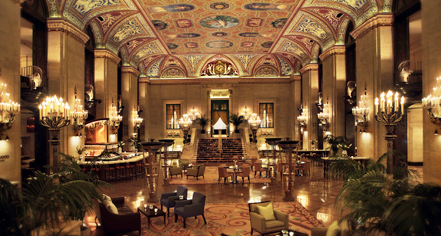 Palmer House®, A Hilton Hotel, a member of Historic Hotels Worldwide since 2007, dates back to 1871. The brownie was invented at the hotel when Bertha Palmer requested a dessert for ladies attending the Chicago 1893 World's Fair. Accessible Rooms: 74 accessible rooms are available. Please notify request at time of booking. Adjoining Rooms: 425 adjoining rooms are available. Please notify request at time of booking. Airport Transportation: Airport ground transportation may be arranged through the hotel's concierge, rates apply. ATM: Located on the Street Level. Cancellation Policy: 24 hours prior to arrival, one night room and tax. Deposit: No deposit required for transient reservations. Early Check-In/Late Check-Out: Early Departure Fee: Contact hotel. Late Check-Out Fee: Contact hotel. Extra Person Fees: $25 beginning with the third person. Occupancy restrictions: Based on room type. Parking: Self-parking: $45.00 for 24 hours (55 E Monroe Garage). Valet parking: $79.00 for 24 hours. Secured: Not Available. Covered: Available. In/Out Privileges: Available. Other Parking Information: Bring ticket to Hotel for validation and payment. Payment: All forms of payment are accepted. Payment is required at time of booking. Visa, MasterCard, Amex, Discover, Diners Club, China Union Pay, Carte Blanche, Bankamericard, Air Canada EnRoute, JAL, and JCB are accepted. Rollaways: Available upon request; surcharge ($40). 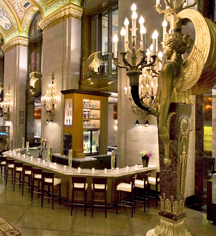 A 25-story Beaux Arts marvel situated in Chicago's iconic Loop District, Palmer House®, A Hilton Hotel is the longest continually operating hotel in the United States, boasting a vibrant heritage and renowned service. Learn more about the History of Palmer House®, A Hilton Hotel .